Your grounds in winter probably look nothing like your grounds in summer! 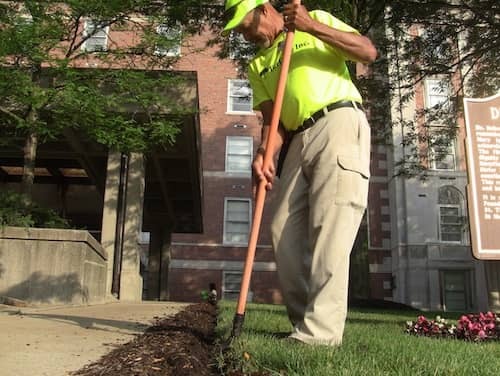 In the first, your buildings are surrounded by snow or slush, and in the second, your buildings are surrounded by lush green grass and healthy trees and flowers. Your summer grounds don’t look like that by chance, however. There’s an in between time that we have to take into account, to do the prep work that cleans up after Old Man Winter and gets our grounds ready to shine in the warm months of summer. Repair turf and curbs that were damaged while hidden by snow. Clean up the gravel and cinders left in parking lots. Remove leaves and sticks that fell to the ground during the winter. Pick up trash or broken asphalt exposed by melting snow. Prune back trees and shrubs with broken or dying branches. Turn over the mulch you laid down in the fall. Apply pre-emergent weed control (because those weeds are likely to be the first green you’ll see once the weather warms up!). Maintain two inches of double-shredded mulch. Apply pre-emergent weed control along with a balanced turf fertilizer to help with spring green-up and to prevent late spring and early summer turf weeds. Make sure the mower blades are sharp! Sharp blades on a well-maintained mower will provide a great first cut that looks good and promotes turf growth throughout the spring. You don’t have to work your way through this checklist to go from winter to summer, but your grounds overall will be healthier and more impressive early in the season if you do. Nor do you have to pass this checklist along to your maintenance crew. You can always outsource the commercial lawn care to a company like Turfscape…and rest easy knowing your grounds will glow.